“The Inside Story” mainly refers to the world championship bathrooms, obviously. This was already announced in the catalogue. I guessed the Anand one in the other thread as it seemed more directly related to a world championship match from the catalogue. Ah, I’d forgotten that we’d put it in the catalogue. At least by accidentally lying, I was able to halt the avalanche of guesses in the comments! Can you say some more words about the “many improvements and updates” on the original german version? The improvements I had in mind were mainly in chess, where we corrected some slips. There will be style differences in language between the German and English versions, but no doubt it’s a matter of taste which one you prefer. Updates are minor: things that have happened in the chess world (e.g the 2018 Candidates) since the German edition was finished. For all that, I am not making a hard sales pitch to German speakers who have already read the German edition. The English version will be broadly familiar to you already. 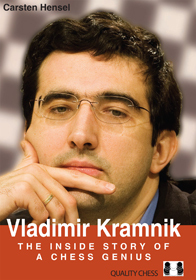 Are you preparing something like “Kramnik’s Best Games”? He does but it’s very old. I think you suggested a Karpov/Tal compendium a while ago. This was the best new book suggestion I’ve seen on this blog! I am offended. I think my GM Preparation series was the best suggestion! Seems good.The first must buy book for a long time. A surprise, but a very welcome one!! As always, top notch work on QC. I’m also looking forward to this one! As a general remark, I think it’s a pity nowaday’s top players hardly seem to write books anymore on their own games, with their own analysis. E.g., it’s all well that Kalinin wrote a book on Caruana’s games, but it’s just not the same as the real thing. maybe top player are not old enough to write memories about their best games. Let them be 40 or 50 years old so they have Something interresting to write about their carreer. Now, we have only Svidler in the 2700+ players ! yes but Anand, Top, Ivanchuk, Kramnik & Adams, already have “their book”. What do you mean with ‘already have “their book”?’ Maybe I missed something, but which book did Ivanchuk write himself, and which book did Adams write? Or do you mean the Move by Move series 🙂 . And if you use 2700+ combined with age as a criterion, nobody will ever write a book. I don’t care if Ivanchuk would have a rating below 2700 at this moment, if he would write about his wonderful career and games from the past. I’m talking about the kind of books players like Tal, Keres, Botvinnik and Smyslov wrote about their lives and games. I just don’t see it happening today. What about Short for example? Surely he is old enough, and I bet he would have lots of interesting stuff to write about. I even have a title suggestion: “Short – the unabridged version”. I’m still waiting for a good book on Boris Spassky. but I’m not sure if that will be what I’m hoping for. I saw that one, it’s by McFarland, so at least it will look good 🙂 . But generally I prefer books with analyses by the players themselves. E.g. Korchnoi’s books are really good. And of course Petrosian has already been published by QC. I agree that a book on Spassky is missing, he’s seriously underrated I think. i hope you are working on this one for next year !? I like that one even better 🙂 . And hopefully in the same mildly ironic tone as his columns for NIC Magazine. I also have a title for this one: “Child’s play”.